Home grown melons are one of nature's most delectable foods. There is nothing quite like a cantaloupe that has gotten so ripe that it has fallen off the vine. Homegrown watermelons too are delicious, but as all seeds are concentrated in the center of cantaloupe, they are much easier to deseed and enjoy than homegrown Watermelon. Melons, however, require a huge amount of watering, and therefore work - deterring most people from growing them. This shouldn't be the case. We must admit that after three tries at growing melons, in our raised bed/Square Foot Garden, we were about through. We would get at most one to two melons, but this required watering every other day. We did at least find our favorite varieties, the cantaloupe cultivars "French Hybrid" and "Ambrosia" - two melons that were so sweet right after picking you wanted to forgo all other food. We finally decided to try growing melons one last time - but this time in a large enough quantity to ensure pollination, and with the Waterboxx to ensure watering. Pollination is obviously vital for melons - if you don't have at least two different melon plants of each variety, it is unlikely you will get a particularly large crop. Bees should be encouraged(we also bought blue orchard mason bees which promptly flew away but did sometimes return). To ensure watering, we used a brilliant invention called the Waterboxx. The Groasis Waterboxx PlantCocoon, or Waterboxx for short, is a device for watering trees and garden plants. It collects and stores rain, dew and other condensation and slowly delivers it to the roots of a growing plant. In many climates with regular rainfall throughout the summer, the Waterboxx never needs to be refilled. In drier climates (of the southwest, for example), the Waterboxx needs only to be refilled every week, at most, with 4 gallons. 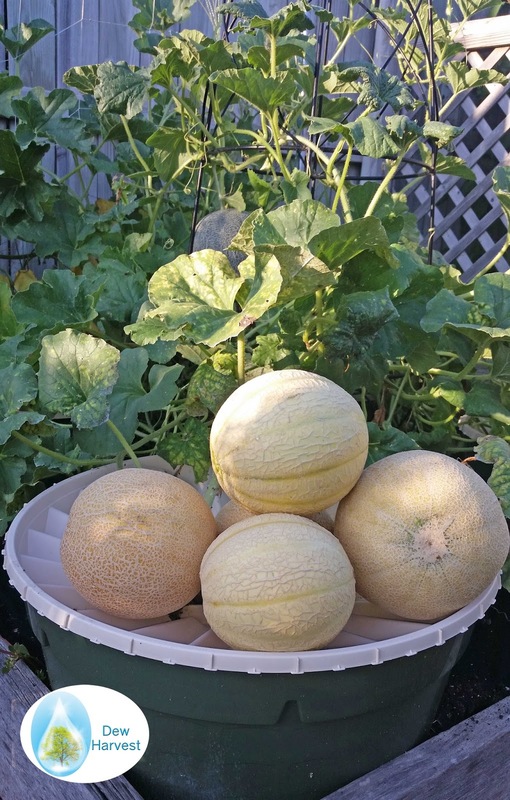 We first decided which melons we wanted to plant - we chose three varieties of cantaloupe and one variety of (seeded) watermelon. We then prepared a space for these - two full 4x4 foot raised beds, without any overlying trellis. Melons have very large space requirements - we satisfied this by having a string trellis at the north side of our two beds for some room for growth. In the second bed, we built an "A" frame for a string trellis. We also cleared a large section of grass and covered it with weed cloth for the melon leaves to spread out. This provided us sufficient room (although the melons did somewhat climb our trellis fence). 8 Melons in 4 Waterboxxes with our A Frame support - the area behind the Waterboxxes was also covered with weed cloth to allow growth.. Here you can already see the size difference between the indoor started (left) and outdoor started (right) melons. 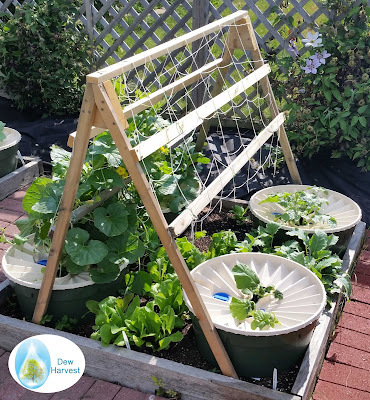 With most cucurbits, it is better to start the seeds outside but we have a relatively short growing season, so we decided to try both indoor and outdoor starting. The indoor seeds we started in peat pots two weeks before outdoor planting. We must say, the indoor started seeds did much better than the outdoor ones. The outdoor started plants were quickly overrun by ants - who seemed to grow their colony (and aphid livestock) faster than our melons grew. Our indoor started seeds, when transplanted whole with the peat pot still in place, grew much faster than the ants and were not seriously bothered by them. Our melons growing quite well mid summer - we did refill the the two Waterboxxes on left once during a dry spell - right after which we received ~4 inches of rain which would have completely refilled them without our intervention. We placed two plants per Waterboxx. We then carefully placed the Waterboxx, making sure we had two wicks in each. After that, there was little to do beside train the vines of the melons to stay off the paths and on the string trellis where we wanted them. We did fill 2 of the 8 Waterboxxes with more water one time - and then immediately regretted this decision. Right after the manual filling we received 4 inches of rain in just a few days - enough to refill the Waterboxxes completely. We are based in Indiana - some areas without consistent rainfall will need periodic refilling (likely every 2-3 weeks). Our A Frame and string trellis is completely covered with the vines of the melons. By mid July we knew our harvest was almost ready. The great thing about growing cantaloupe on trellises is that they will fall off when ripe - the gardener just needs to check the ground daily for fallen melons and take them inside. 5 "French Hybrid" melons hanging on the inside of the A Frame with the Waterboxx just barely visible. 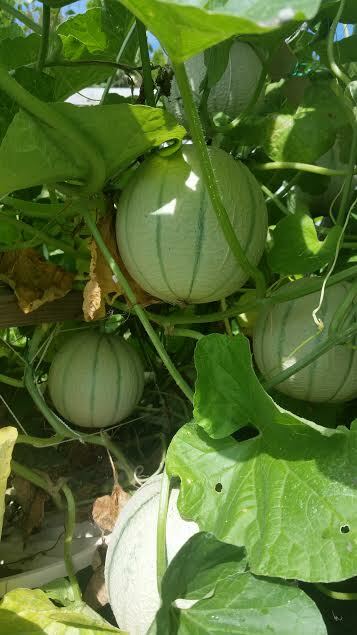 Ripe melons will also change colors from green to tan . It is important to check the garden every day for newly ripened melons because ants and soil organisms also want the sweet melons and can get through the outer skin in about 24 hours. Here is a single day's harvest of melons from a 4x4 foot bed of Waterboxxes growing melons - with no water manually added for months. At its height, our Waterboxx melon garden was giving us 5 (5!) fresh melons per day. We found we could only eat one to two so family and friends also received Waterboxx melons. 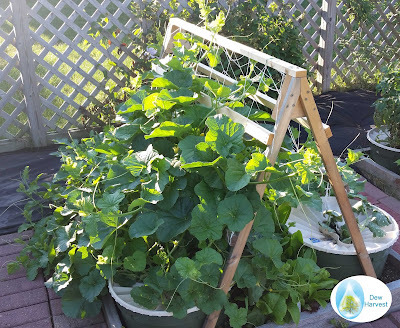 After almost giving up on melon growing, we found that the Waterboxx brought us profound success. 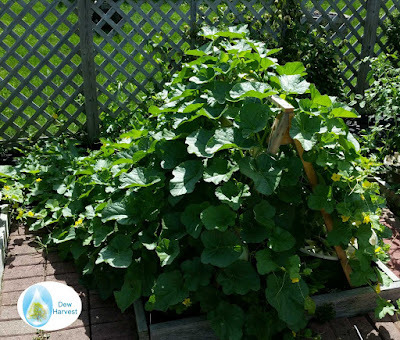 We plan to continue growing melons each year with the Waterboxx - of course rotating the area where we grow them and replenishing the soil with compost yearly. 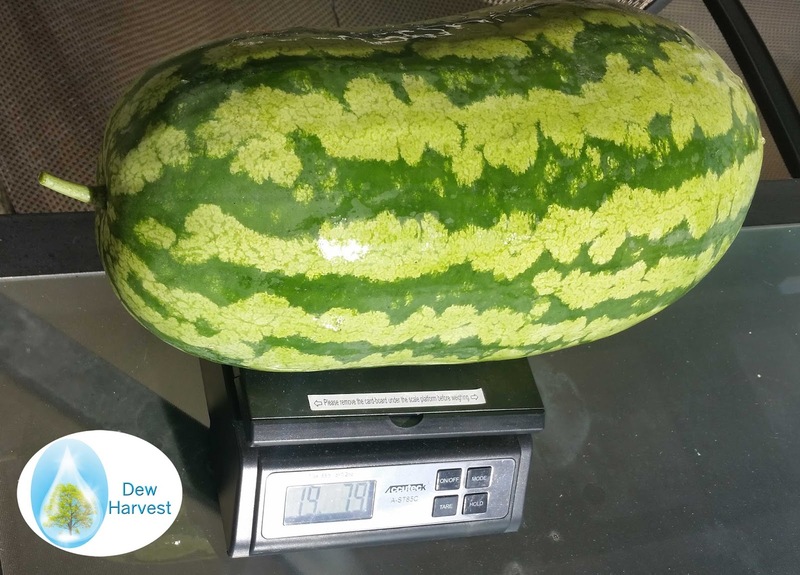 If you want to try to grow melons with the Waterboxx, you can buy the Waterboxx here or learn more on our website. The Waterboxx can also be used to grow tomatoes, peppers, zucchini, squash, pumpkins, and eggplants.